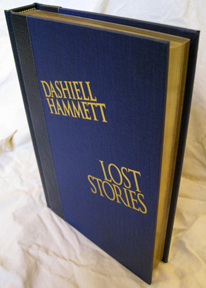 Lost Stories rescues 21 long-lost Hammett stories. For several stories, this is the first book publication. For all but five, this is the first hardcover publication. All stories have been restored to their original versions, replacing often-wholesale cuts with the original text for the first time. For each story, Hammett researcher Vince Emery tells how Hammett's life shaped the story and how the story affected his life. 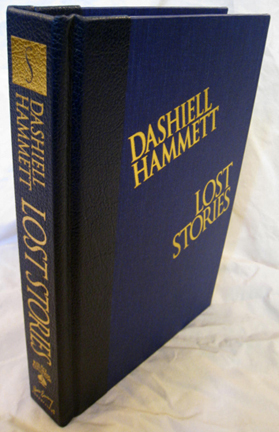 Emery's comments reveal surprises about Hammett's life not covered in any other book. To round out this celebration of Hammett, three-time Edgar Award winner Joe Gores has written an introduction describing how Hammett influenced literature, movies, television, and Gores' own life. Joe, who passed away in 2011, credited the impact his introduction had on the Hammett family with persuading them to change their minds and give him the permission to write Spade & Archer, the prequel to The Maltese Falcon. ♠ Copyright page stating "FIRST EDITION; Publication date March 2005; Limited to 195 signed, numbered copies; Precedes trade hardcover edition"
♠ Signed by Joe Gores and Vince Emery. 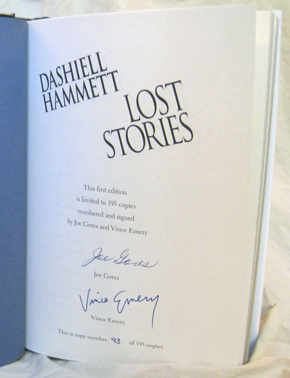 We signed these in San Francisco on March 19, 2005, just after we attended the ceremony declaring 891 Post Street a National Literary Landmark (where apartment 401 was occupied by Sam Spade in The Maltese Falcon and by Hammett while he wrote that novel, Red Harvest, The Dain Curse, and most of The Glass Key). Joe and I went to a cafe two doors down Post Street, signed, and swapped stories. 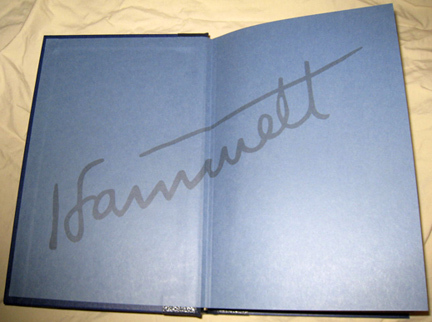 It was a great day for me as a fan of both Hammett and Gores. 8 illustrations, 38 photographs; 352 pages, $149.95, ISBN 0-9725898-0-5. This deluxe edition precedes the trade hardcover edition by several months, and thus is the true first edition of this book. 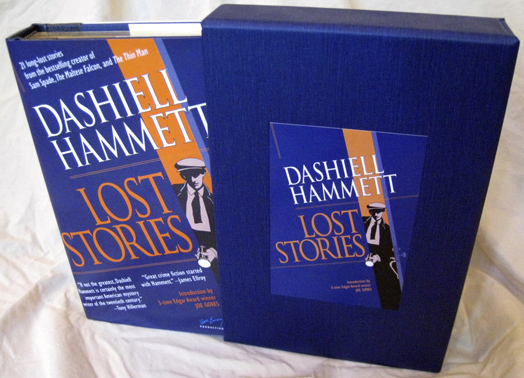 It is without a doubt the most elegant, impressive first edition of a Dashiell Hammett book. Note that this deluxe limited edition is NOT available for sale to the book trade from Independent Publishers Group (IPG). To order your copy of the deluxe limited edition of Lost Stories, send a check or money order for $158.45 per copy ($149.95 plus $8.50 postage) to Vince Emery Productions, P.O. Box 460279, San Francisco, CA 94146 USA. If you live in California, please add $12.75 per copy for sales tax. Quantity discounts on the deluxe limited edition are available for purchases of 2 or more copies. For information about quantity discounts, please email vince @ emery.com. Click here for information about the trade hardcover edition. Boring legal stuff: Copyright 2005-2012 Vince Emery Productions. "Vince Emery" is a registered trademark of Vince Emery Productions. "Vince Emery Productions," "emerybooks.com," and the Vince Emery signature are trademarks of Vince Emery Productions. So there.